Under the patronage of the Commission on Science and Technology for Sustainable Development in the South (COMSATS), the Islamic Educational, Scientific and Cultural Organization (ISESCO), and the OIC’s Standing Committee on Scientific and Technological Cooperation (COMSTECH); the University of Dhaka, Bangladesh; and the Bangladesh University of Engineering and Technology (BUET), Bangladesh, organized the International Workshop on Nano-technology on September 21-23, 2012, in Dhaka, Bangladesh. The workshop was held with the objective of providing a forum for academicians and professionals from various developing countries to exchange ideas and enhance collaboration in the field of nano-technology, and to sensitize the policy makers, academia, public and private sector businesses and industries, and research organizations towards promoting studies, research and the use of nano-technology. The technical proceedings of the workshop were spread across 4 technical sessions that comprised lectures and presentations on various aspects of Nanotechnology. Apart from the lectures specific to nano-technology, the experts also covered its applications on other interdisciplinary fields, which included: Health and Medicine; Food and Agriculture; Energy and Environment; Nano-technology in ICT and Electronic Devices; and Industry and Consumer Products. The three-day international workshop was inaugurated by the Prime Minister of the People’s Republic of Bangladesh, H.E. Ms. Sheikh Hasina Wajid. In her remarks, the Prime Minister considered research programmes imperative for making progress in science and technology. Appreciating the organization of this well-timed workshop in Bangladesh, Her Excellency stated that nano-technology can directly benefit the local industries in different sectors, and encouraged public-private partnership in this regard. The Prime Minister informed that the scientists of Bangladesh have made a breakthrough in the field of gene research by decoding genomes of the jute in 2010 and a devastating pathogen harmful for nearly 500 crops including jute. She also pledged support of her government for the establishment of a National Centre of Nano-technology in Bangladesh. H. E. Mr. Dilip Barua, Minister for Industries, Government of the People’s Republic of Bangladesh, also attended the event as the ‘special honourable guest’ of the event. The Vice-Chancellor BUET, Prof. S. M. Nazrul Islam; Vice Chancellor University of Dhaka, Prof. Dr. A.A.M.S. Arefin Siddique; and the Deputy Director General ISESCO, Dr. Mukhtar Ahmad, were also among the distinguished guests who spoke at the Inaugural session of the workshop that was attended by 300 people from different walks of life. 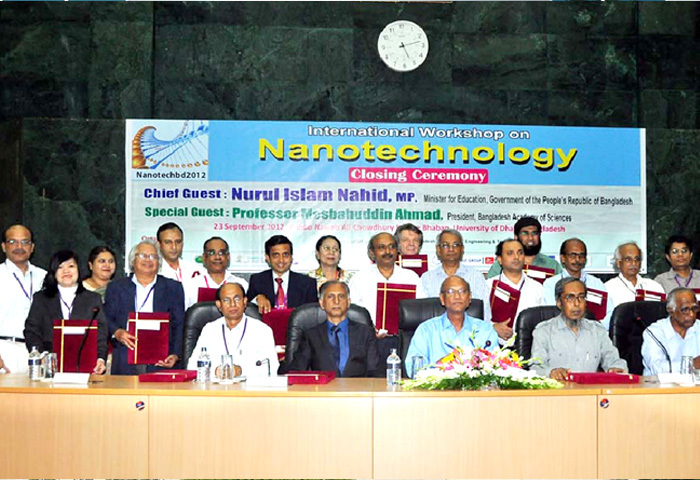 About 25 experts belonging to important scientific and academic institutions of Bangladesh, Canada, Germany, India, Malaysia, Philippines, Pakistan, Sri Lanka, Thailand and USA, delivered lectures on the key topics on various aspects of nano-science and technology. Around 100 participants from different universities, research institutions, industries and government and private companies benefited from the lectures and oral presentations delivered during the workshop. Other distinguished guests of the closing ceremony included Prof. Mesbahuddin Ahmad, President, Bangladesh Academy of Sciences; and Prof. Dr. M. Afzal Hossain, Former Vice Chancellor of Hajee Mohammad Danesh Science & Technology University, Bangladesh. The event also included poster presentation session as well as panel discussions to finalize recommendations.